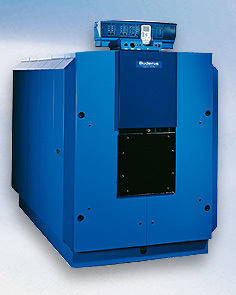 Novel Care is your #1 choice for Buderus Commercial Boilers in Toronto. 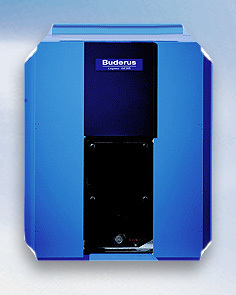 Buderus Commercial Boilers are some of the most economical and clean ways to generate heat for your commercial building. They have the ability to significantly reduce to cost of operating your commercial building by reducing the amount you spend on monthly heating. Buderus Commercial Boilers also run so clean and efficient that they can impressively improve the environmental footprint of your building. 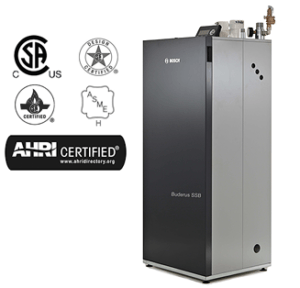 The Buderus SSB Industrial Boilers were designed to deliver the highest quality, flexibility and dependability in the industry. 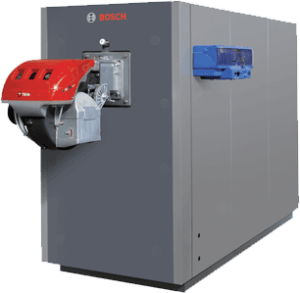 With a small footprint (31.5” x 36”), minimal clearance requirements and output range from 800 to 8,192 MBH, these boilers can be utilized in almost any application. If redundancy is what you’re looking for, then these boilers are the answer. Each SSB Industrial Boiler has two fully independent heat exchangers which can be operated individually if necessary. In addition, the SSB1000TL boilers have an innovative design which allows up to 4 of these boilers to be cascaded on either side without any additional purchased venting parts or accessories. Efficiency levels up to 96.8% with up to 80:1 turndown capability. Built-in redundancy with up to 16 heat exchangers (2X, SSB1000TL4). Proven 316L stainless steel water tube heat exchanger with dual parallel helix tubes. Consistent combustion with modulating gas valve and stainless steel mesh burner. Easily accessible components with removable panels on all four sides of the boiler. 10-year full heat exchanger warranty, with a 2-year warranty for parts. All connections (exhaust, intake, supply, return and gas) available on both sides of the unit. Easily connect up to 4 boilers with zero additional purchased parts or accessories (SSB1000TL only). Small size (31.5” x 36” x 70”) and minimal clearances allow installation in almost any location. 7” external touchscreen display for intuitive system control and monitoring. Internal HMI screen allows for advanced boiler adjustments. Field-convertible to either natural gas or liquid propane. Communication with Modbus, BACnet and LonWorks protocols. For maximum efficiency, Buderus SSB Boilers achieve consistent combustion throughout the entire length of the burner tube due to a patented laser perforated design. 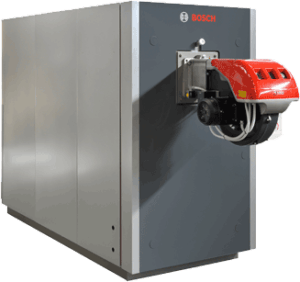 The new Buderus SSB Series was specifically tailored by Bosch to give you all the same features and benefits from a small residential boiler through a large commercial cascade application. Single platform design for all Buderus SSB’s makes installation and commissioning easy, regardless of the output required. a host of venting options. 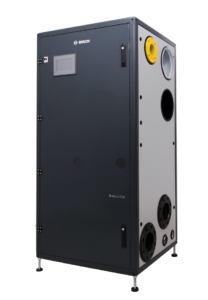 The Buderus SSB boilers are CSD1 compliant thanks to built-in LWCO and adjustable manual reset high limit. Peace of Mind: 10 years full on the heat exchanger, 5 years on parts and labour (residential) and 2 years on parts and no labour (commercial). Reliability: heat exchanger and entire burner assembly are made of 316L stainless steel. Comfort: providing comfortable heating with or without indirect domestic hot water tank from a small studio unit up to commercial cascade applications. Ease of Installation: automatic control unit for gas-fired appliances with a premix burner and a pneumatic air-gas system. Factory built-in LWCO and Safety Temperature High Limiter w/ manual reset. Control: the SSB has multiple parameters, for heating, domestic water heating, and circulator pump, each designed for the most common applications. This high-efficiency condensing boiler features design flexibility for retrofit and new construction projects. With inputs ranging from 563 to 2200 MBH, the Buderus SB625WS Series has an increased maximum operating pressure to 80 psi, and a 10-year non-prorated limited warranty. A full three-pass flue design extracts latent heat and maximizes overall efficiency. With this boiler, project costs are reduced due to simplified piping. With inputs ranging from 3003 to 5443 MBH, the Buderus SB745WS Series has an increased maximum operating pressure to 80 psi, and a 10-year non-prorated limited warranty. Eliminates the need for bypass loop or shunt pump. Minimum supply temperature of 122° F with standard control.